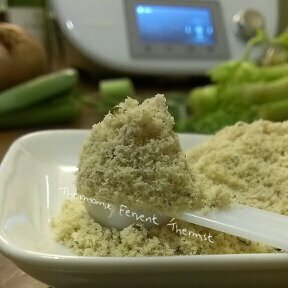 Thermomix Homemade Chicken Stock in powder form. I personally will prefer to make stock in powder form, easier to store and take care, also easier in measuring. Beside homemade mushroom seasoning powder this is my second choice for daily cooking. I have tried using this on stir fry veggie and pumpkin soup, it really makes so much different to enhance tastiness of the food you prepare. I chose organic and high quality ingredients for all homemade, and guess what? The cost for making chicken stock and mushroom seasoning still cheaper than buying from store. I am so glad to have bought Thermomix.